Today, the "Protection of Public Participation Act" gained Royal Assent and became law in British Columbia. Finally, BC has Anti-SLAPP legislation that will help protect people from lawsuits designed to silence their voices. We have been fighting for this type of law in BC for years and, thanks to your support, people will now have additional protections from large corporations who seek to intimidate them. But we are not done yet! We are going to continue the fight until every province and territory in Canada has Anti-SLAPP protection. Can you help us make it happen by making a donation today? 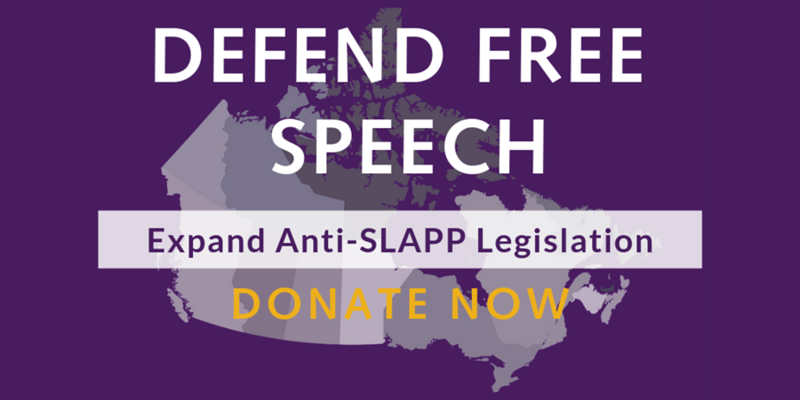 Right now, only Ontario, Quebec and now British Columbia have Anti-SLAPP protections. This means over 9,374,915 people in Canada are living without this essential protection and are especially vulnerable to have their speech shut down by big moneyed interests. We know the road will be long and that is why we need your help today to make it happen.